An homage to the men and women of science, and an exposition of Einstein’s place in scientific history In this fascinating collection of articles and speeches, Albert Einstein reflects not only on the scientific method at work in his own theoretical discoveries, but eloquently expresses a great appreciation for his scientific contemporaries and forefathers, including Johannes Kepler, Isaac Newton, James Clerk Maxwell, Max Planck, and Niels Bohr. While Einstein is renowned as one of the foremost innovators of modern science, his discoveries uniquely his own, through his own words it becomes clear that Einstein viewed himself as only the most recent in a long line of scientists driven to create new ways of understanding the world and to prove their scientific theories. Einstein’s thoughtful examinations explain the “how” of scientific innovations both in his own theoretical work and in the scientific method established by those who came before him. 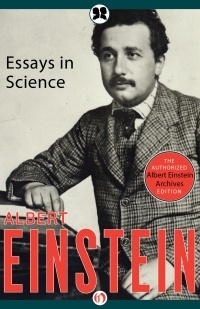 This authorized Philosophical Library edition features a new introduction by Neil Berger, PhD, and an illustrated biography of Albert Einstein, which includes rare photos and never-before-seen documents from the Albert Einstein Archives at the Hebrew University of Jerusalem.